Let’s first establish that I know full well that the labor market is a lagging indicator. Having said that, let’s look at some off-the-radar labor metrics that don’t garner a lot of attention. Unfortunately, the JOLTS series only goes back ten years, but the picture this paints of slack in the labor market is not a pretty one, with fully six Americans vying for every job opening. Yes, initial jobless claims did come down 26k (from yet another upwardly revised figure — the 23rd in a row) to 550k in the September 5th week. But claims are basically range-bound and at 550k are clearly still consistent with net job loss — they need to break below 500k to stop the bleeding in the U.S. labour market altogether and below 400k to start the process of reversing the uptrend in the unemployment rate. At this stage of the 2002 decline in claims from the peak, they were hovering just above 400k, not 550k, and that turned out to be a huge jobless recovery. This will make a mockery out of that one and the prospect that we see the spread between the U6 and the official unemployment rate measures mean revert will imply an unhappy meeting in the middle at around 12%. Just in time for the mid-term elections; tell us that we will not see a U.S. dollar depreciation as the next rabbit out of the hat (a la FDR circa October 1933). The total level of claimants, including those on extended benefits, soared 158k in the August 22nd week to a fresh all-time high of 9.8 million. 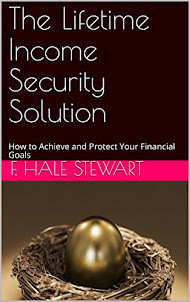 Before the onset of the recession in late 2007, that number was hovering around 2.5 million. Of course, that didn’t stop the U.S. consumer, who continued to binge on credit, but I pointed out the other day that the jig is clearly up with regard to borrowed money. Now, the National Federation of Independent Business (NFIB, “The Voice of Small Business”) takes lots of surveys and polls its members about a host of issues. They publish their results monthly in their Small Business Economic Trends. Let’s have a look at a couple of this month’s entries. It would appear that perhaps a better name for this first item might be the Small Business Pessimism Index Components. What is the predominant problem that small businesses are facing? Let’s have a look, shall we? As I mentioned recently, we have been an economy bolstered by government steroids for the past several months. I'm not taking issue with that -- it was clearly the right thing to do -- just stating the fact that we really don't have much clarity as to what the economy would look like absent the government largesse we've seen over the past six months or so. Given what I see in the labor market, the fact that earnings (talking publicly traded companies here) have come almost exclusively from cost-cutting (and virtually no top-line revenue growth), and the fact that small businesses are still hurting badly, I just don't see much more than scraping along the bottom, with a distinct risk of double-dip. The stock market made a new post-crash high this week. Now comes the weekend. I'll be stepping out for dinner and some nice wine in a little while. Whatever you do, make sure you take time to enjoy yourself! Now that most economists believe that the economy has ended the recession and entered recovery (defined by GDP terms), the question remains, "when will the economy start to add jobs?" This point was aptly made by Paul Krugman, who last week said on his blog, "the fact that the economy may be technically in recovery is irrelevant" to the vast majority of Americans, for whom the most important metrics by far are jobs and wages. So, I plan on exploring that question in depth in a few blog posts, because there are a number of data series that do have a history of leading job growth. Last week, "only" 550,000 new claims were made -- which was the least number of claims since early January (leaving aside a couple of weeks in mid-July, which may have been affected by an unusual pattern of auto plant closures). Initial jobless claims are one of the 10 Leading Economic Indicators. Thus they can be expected to lead job growth/loss and also to lead the unemployment rate. A few other bloggers have tried to calculate how much of a fall in initial claims might be needed to generate actual job gains. Berkeley Prof. Brad DeLong believes they must fall under 400,000 per week, basing his opinion on both rising and falling claims for the last two, "jobless" recoveries. Now, much as I esteem the good Professor, in this case the data contradicts him. For example, in both the deep 1974 and 1982 recessions, the economy started to add jobs when jobless claims fell past the 500,000 mark. Also, there is a big difference between the meaning of the data in rising and falling employment situations. Just this year, in January, when jobless claims exceeded 550,000, that coincided with over 600,000 net jobs lost. Last month, with 570,000 claims a week, the economy shed about 1/3 of that number, 216,000. As Calculated Risk points out, layoffs are only half the story in calculated job growth vs. loss, because we must also know new job hires as well. For example, in a contracting economy, 500,000 job losses a week (or about 2 million a month) might be offset by 1.7 million new hires, for a net loss of -300,000. In an improving economy, those layoffs might be offset by 2.1 million new hires, for a net gain of +100,000 jobs. Previously I have found that (1) in those recessions and recoveries where jobless claims fell steeply, peak unemployment occurred within 2 months of the point where jobless claims fell 12% from the peak; but (2) in those recessions and recoveries where jobless claims fell slowly, peak unemployment occurred not at the 12% mark, but only when new jobless claims were more than 16% less than peak claims, and stayed more than 16% off for at least 3 months thereafter. Let me show you that in both chart and graph form. Based on that work, I believe that the economy will start to add jobs when the initial jobless claims rate drops past 550,000, and stays significantly under that number (about 530,000 or less) for three months, or else quickly drops under 500,000. But of course, that begs the next question, which is, how can we tell if jobless claims are moving in that direction or not? There are several other data sets that help pinpoint this, and that's what I'll explore next week. This morning brings us two more bits of news that coincide with the story of incipient Recovery. The University of Michigan consumer confidence index rose to 70.2, and expectations to 69.2, both of which are the second highest readings all year (June was slightly higher). Meanwhile, the Census Bureau reported that wholesale sales rose +0.5% in July, while inventories fell -1.4%, meaning that the July inventories/sales ratio for merchant wholesalers declined to 1.23. At the height of the expansion, this ratio was 1.12. It collapsed to 1.35 by January during the economic free-fall. More importantly, tighter inventories ultimately lead to hiring in manufacturing, and this ratio is right where it was in 2002 and early 2003 just before jobs started to increase in the last Recovery. As of today I am formally on vacation. I will be returning Monday, September 21. Until then, Invictus and New Deal Democrat will be providing content. Nobody's right if everybody's wrong. I see that among our happy trio it's two against one. I like my odds. Game on. There are several reasons why I asked Invictus to write here. First, he is a good friend who is very knowledgeable about the economy. For example, he actually knows there are several employment reports and is thoroughly versed on the strengths and weaknesses of each placing him light years ahead of most internet economists. Secondly, he writes exceedingly well. And third, he provides much needed balance to my bullishness. Yesterday he wrote an article titled Not Yet Ready to Party where he expressed his concerns about future growth. His argument centers on the US consumer. Essentially, he is concerned that the percentage of growth attributable to consumer spending will decrease as a percentage of the US economy. He argues that the instead of accounting for approximately 71% of GDP growth, PCEs will revert to their historical median 65%. The decrease will be caused by a return to frugality -- consumers will simply stop spending in response to a poor labor market and to pay down their high level of current debt. As a result, GDP growth will be slow or non-existent. What are some of the big trends you're seeing in retailing right now? The consumer has definitely stabilized, and we have achieved this idea of a new normal. So consumers are still clipping coupons. They're still trading down to private labels. On the luxury side, fashion isn't selling as well. The consumer is willing to invest in something if she can use it for a long time. But if it is just fashion, it is only going to be in style for a season or two. Everyone faced a different kind of financial crisis in 2008. At the low end, the dollar stores have done very well. So your average household has probably shopped more at the dollar stores. To me, the most interesting change has been the big move to eating at home. We were starting to see that trend in 2007 with higher gas prices. Then, when the recession hit, that accelerated significantly. So anyone who can sell food has seen a significant uptick in traffic, starting in 2008, although the amount spent hasn't necessarily responded because of the trade-down to private-label goods, where prices are cheaper. For a while, you were seeing an increase in sales of prepared foods. But once again, as the consumer really hunkered down, you saw a significant increase in the sales of scratch baking products. So consumers were buying food processors, pots and pans -- items they didn't have because they ate out so much. Consumers are spending where they see value, though different consumers define value differently. How else have consumers' habits changed? The consumer isn't thinking, "Do I spend it here or there?" Now it's, "Do I spend it or save it?" A lot of retailers are worried about the consumer's appetite for credit. People don't want to leverage up again, and they want to feel that they can manage within a budget. Some retailers are saying that the consumer isn't putting that extra item in the basket. And so even if it was a low-priced item, units per transaction are down. AMERICA'S FLING WITH BLING MAY BE OVER, but the shift to thrift -- brought on by a sagging economy and stock market, and heralded on the cover of Time -- also has gone too far. According to Gallup, the polling organization, Americans cut their daily expenditures by more than 40% in the past year. That's not just fewer lattes; it's muscle and bone. As savings rise and the market rallies, however, a new consumer is emerging, seeking a sensible middle ground between the gross excesses of the mid-2000s and the privations of the past year. He -- and more often, she -- is likely to find it in companies that offer great products, excellent service and outstanding value, which, by the way, doesn't always mean the lowest price. As a result, I think consumer spending will contribute to growth but at a slower rate. Notice that during the most recent expansions there has been a sweet spot of year over year percentage change between 2.5% an 5%. Interestingly enough that number has never consistently been between 0% and 2.5% during an expansion. Yet there is nothing that says the year over year percentage change can't be at that level; it just never has. The median quarterly change in PCEs for this period was 3.2%. Notice how in the last two expansions the quarter to quarter PCE percentage change ranged from (in general) 2% to 4%. There is nothing indicating that rate of change couldn't be between 0% and 2%. 1.) The consumer's situation (high levels of debt) and the economic situation (higher unemployment) will lead to lower consumption expenditures. 3.) While the consumer will be spending less on items, when he does spend he will want more for his money. Instead of walking into a store, purchasing an item and leaving, the consumer will do more up-front research into items and want more service when he does purchase. 4.) The current drop in consumer spending is very much a by-product of low consumer confidence brought on by the worst recession of the last 60 years. As the economy emerges from this, consumer confidence will rise and spending will increase. However, spending will not increase to previous levels. Instead, we can expect the consumer to increase his personal consumption expenditures in the 0%-2% range of quarter to quarter growth. The next question is where will the money come from. The first answer to that is that while income has been dropping, it appears to be stabilizing. Here is a chart of the last 6 months of total wages and salary disbursements. 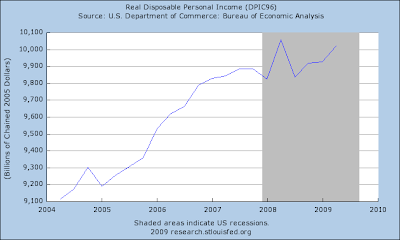 Real disposable income has actually been increasing. A large reason for this increase is an increase in government transfer payments which in turn have gone to increased savings. However, the point is the money is available for increased consumption when consumer sentiment picks-up to a point where it can increase. The above points come from an article I wrote titled the Fits and Starts Recovery where I outlined where I see growth coming from for the next 12-18 months. Only time will tell who is right -- or if either of us is right. However, I welcome Invictus' insights and am pleased to have him aboard. Apparently, the curse of my blogging life is the sisyphian task of debunking the use of lagging indicators to forecast the future. Looking ahead, Christmas season is likely to be miserable with poor sales, poor margins, more store closings, and more bankruptcies. Consumers are increasingly going to be asking "Do I really need this" as well as "Can I really afford this?" Increasingly, the answer is going to be no. There's just one small problem with that analysis. Consumer credit is a totally reliable lagging indicator. Here's a couple of graphs showing the relationship among 3 data series: real retail sales (red), jobs (green), and consumer credit (blue). I have graphed in year-over-year terms to better show the trend, so this is the "first derivative" of the "real" numbers -- but the general relationship holds for the "actual" numbers as well. Notice the order in which each series turns. 1. First, real retail sales turn (red). 2. Then, jobs turn (green). 3. Finally, about a year after real retail sales turn, consumer credit turns (blue). Real retail sales turned in December 2008. Consumer credit will probably turn in about December. 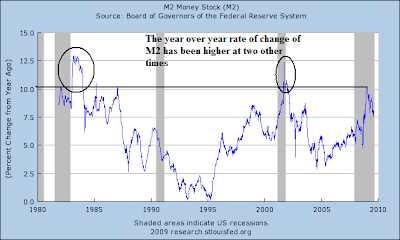 So, Mish is projecting a lagging indicator to predict what a leading indicator will show in four months. To the contrary -- granted this is a really low-expectations comparison -- it appears far more likely than not that this year's holiday sales will be better than last year's. In the week ending Sept. 5, the advance figure for seasonally adjusted initial claims was 550,000, a decrease of 26,000 from the previous week's revised figure of 576,000. The 4-week moving average was 570,000, a decrease of 2,750 from the previous week's revised average of 572,750. In other words, we have more improvement in the labor market. Here is the chart, with the 4-week moving average. About every six weeks the Federal Reserve issues the Beige Book. This is anecdotal information collected from each Federal Reserve district. It provides a good overview of the current situation in the economy. Let's take a look at what the report says. Residential real estate markets remained weak, but signs of improvement continued to be noted. Chicago, Richmond, Boston, and San Francisco observed an uptick in sales over the last six weeks, while sales in the Philadelphia District were described as steady. St. Louis commented that residential home sales had not improved. Most Districts reported that sales remained below the levels of a year earlier. However, Atlanta, New York, Cleveland, and Minneapolis documented some year-over-year gains in select markets. Most Districts noted that demand remained stronger at the low-end of the housing market. Boston, Cleveland, Dallas, Kansas City, Richmond, and New York indicated that the first-time home buyer tax incentive was spurring sales. However, Philadelphia did note an upturn in sales at the high-end of the market. Reports on house prices generally indicated ongoing downward pressures, although Dallas and New York noted some increases. Construction remained at low levels overall, although Chicago and Dallas reported a small increase in activity. The points made are consistent with the following charts of homes sales. New homes sales have bottomed and are showing a slight increase. Existing home sales increased at a good rate last month. The prices of single-family homes in 20 major cities rose a not-seasonally adjusted 1.4% in June, the second increase in a row after falling every month for three years, according to the Case-Shiller home-price index released Tuesday by Standard & Poor's. Reports on commercial real estate markets indicated that demand for space remained weak and that construction continued to decline in all Districts. Atlanta, Philadelphia, Richmond, and San Francisco reported that vacancy rates increased, while rates held steady in the Boston and Kansas City Districts and were mixed in New York. Boston, Dallas, Kansas City, Philadelphia, and Richmond commented that the demand for space remained weak. Commercial rents declined according to Boston, Chicago, New York, Philadelphia, and Richmond. Rent concessions were reported in the Richmond and San Francisco markets, and Richmond noted that some landlords had postponed property improvements in an effort to conserve cash. Construction remained at very low levels, with modest improvements noted in public construction in the Chicago, Cleveland, and Minneapolis Districts. While $30 billion is not good, it is hardly a fact on which to make calls for an apocalypse. In short, the market should be able to handle that. While other estimates place the total losses higher (at a maximum rate of $150 billion) it's still not a a level where we should be making doomsday predictions. And while there is also trouble in commercial mortgaged baceked securities, the concern is over roughly $100 billion in total problem loans that will come due and have to be refinanced by 2012. That means the loans will have to be dealt with over a period of 2-3 years. While the development is not good and should not be applauded, this is a manageable disaster. Most Districts reported modest improvements in the manufacturing sector. Philadelphia, Richmond, Atlanta, Cleveland, and Chicago all reported slight-to-moderate increases in new orders. San Francisco indicated that new orders increased for manufacturers of semiconductors and other IT products, while orders declined for metal fabricators and petroleum refineries. Dallas noted that orders held steady, while St. Louis reported that manufacturing output continued to decline, but at a slower pace. Richmond, Atlanta, Chicago, and Minneapolis reported increases or planned increases in automobile and automobile-related production. Several Districts also noted increased production in the pharmaceutical industry. The Empire State index (NY) has been increasing for several months and is now above 50. And the national ISM number is now above 50, indicating expansion in the manufacturing sector. Overall, manufacturing is showing clear signs of pulling out of the recession. Labor market conditions remained weak across all Districts, but several also noted an uptick in temporary hiring and a decline in the pace of layoffs. Richmond reported that most service-providing firms continued to cut employees, while Minneapolis and New York noted additional layoffs in the manufacturing sector. Cleveland reported modest job declines in the banking, commercial construction, and coal mining sectors. Further job cuts are expected in auto manufacturing according to St. Louis, and Dallas indicated further staff reductions are anticipated in the airline, energy, and residential construction sectors. Staffing firms in a majority of Districts reported a modest increase in the demand for temporary workers, although industry contacts in Boston also questioned whether these gains will persist. New York cited a modest pickup in temporary hiring for the legal and financial industries. Chicago noted an uptick in demand for workers in the healthcare and information technology industries. St. Louis and Minneapolis reported that federal stimulus funds have had a positive impact on construction and local government jobs. 1.) The rate of job destruction has decreased since the beginning of the year. Remember that at the end of last year the beginning of this year, the economy was losing 600,000 jobs per month. To expect that figure to turn around and print a positive number within 6-9 months is highly unrealistic. In fact, it is most possible that we'll see job losses through the next 3-6 months. But the pace of job losses is decreasing which is good news. 2.) The increase in the unemployment rate is bad news, plain and simple. 3.) The steady size of the number of people working part-time for economic reasons along with the possible topping out of discouraged workers is also good news as it indicates a possible topping of two categories of labor under-utilization. 4.) Two of the four time periods of unemployment showed improvement last month and the worst category (people unemployed for 27 weeks and longer) showed a far slower rate of acceleration. 5.) The increase in the marginally attached and the number of people unemployed for 5-14 weeks are bad developments. There is one important point with the unemployment rate: it is a lagging indicator. History shows us that on a year over year basis, GDP must turn positive before we can even think about a decline in the unemployment rate. As such, we're simply not in a position to be talking about a drop in the unemployment rate yet. Consumer spending remained soft in most Districts. The majority of Districts reported that retail activity was flat. Boston, Philadelphia, and Kansas City noted improvement in sales, but attributed the increase primarily to back-to-school purchases. Philadelphia, Chicago, Cleveland, and San Francisco observed that shoppers remained focused on essentials and continued to refrain from purchasing discretionary and big-ticket items. Kansas City and San Francisco noted weak restaurant sales. Richmond, Philadelphia, Chicago, Atlanta, and Boston remarked that retailer inventories were being closely monitored and were keeping them in line with low sales levels. 1.) Housing sales have stabilized. 2.) Housing prices are still declining on a year over year basis, but have shown improvement over the last two months. 3.) The talk of a commercial real estate "implosion" is a bit far-fetched. There are problems but they are manageable. 4.) Manufacturing is now expanding. 5.) The labor market is still weak, but the rate of job loss continues to decrease and metrics within the jobs report (the number of people unemployed for specific lengths of time) is showing improvement. The latest Beige Book mentions in several places of an uptick in temporary help. Finally, the unemployment rate is a lagging indicator; it is unrealistic to talk of an improvement in the unemployment rate when GDP is still contracting. 6.) Consumer spending has bottomed. 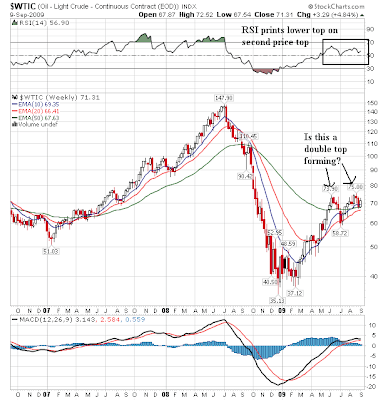 The main question on the weekly chart remains whether or not oil is forming a double top. Note the RSI has printed a lower top on the second price, indicating a technically weaker price. In addition we have the seasonality factor - the US driving season is over. However, also note the 10 and 20 week EMAs are still moving higher and that the 10 week EMA has already moved above the 50 week EMA. The daily chart adds a great deal of weight to the double top thesis. 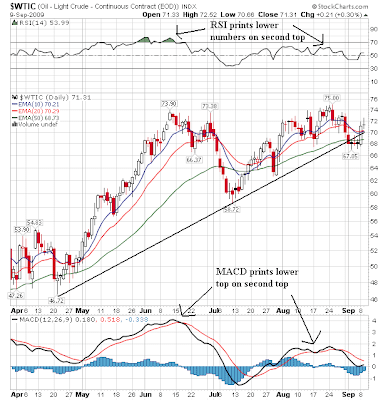 First, the second top had a much lower MACD and RSI reading. In addition, prices have already broken the uptrend that started in late April. Also note that over the last week oil has printed some very weak candles -- indicating a lack of conviction on the part of traders. "The fact that the economy may be technically in recovery is irrelevant." -- Paul Krugman, on his blog, Sept. 4, talking about the importance of the labor market. Now me, I'm not even sure that we're in a recovery yet. We've had massive government incursion into both the financial sector and the automotive sector. We're being propped up by the spring's stimulus package. In a nutshell, it's virtually impossible to determine where the economy would be left to its own devices. We may be out of intensive care, but we've still got tubes running every which way and require a room near the nurses' station. Sadly, the one sector of the economy that the federal government has relatively little influence on is the labor market, which continues to bleed jobs (yes, yes, at a slower rate than last winter). Unemployment claims seem stuck in mid-500k range, and it's a sure bet the unemployment rate will head somewhat higher before topping out. Sure, ISM printed above 50, but is it sustainable and how many people did last month's print put to work? What is going to be the driver that turns the labor market around? We know that Personal Consumption Expenditures (PCE) rose to roughly 71 percent of our $14 trillion GDP. The mean is around 65 percent. If PCE simply reverts to the mean, that would imply a loss of about $850 billion of GDP that needs to be "made up for" elsewhere. Anyone? Bueller? Exports? What? In short, it's almost laughable to talk about the banks' supposed unwillingness to lend -- it appears no one wants their money in any event. Credit was to the last expansion as steriods were to baseball during the home run bonanza that lasted until the league cracked down. I actually looked at the At-Bats/Home Run for players like McGwire, Bonds, and others. It was remarkable how the number dropped during the period they were suspected of (or actually were) using banned substances. That metric floated right back up once they were off the juice. In short, steroids and HGH turned superior players into almost superhuman athletes. Once ridded of the Bruce Banner-like gamma radiation, they came back down to earth. Similarly, our extraordinary economy got artificially pumped up by credit, and we are only now coming off that high. However, unless/until we find another way to get our fix, the road to recovery is going to be subpar at best (but we'll be economically healthier in the long run). I have focused almost exclusively on the consumer in most of what I write, for the simple reason that I think no recovery will have any sustainability without the consumer on board. On that point, I would note that the Fed's Flow of Funds Report -- one of my favorites, along with CFNAI -- comes out next week. It is always a fascinating report chock full of all manner of goodies. So, that's where I'm at. Not yet ready to break out the bubbly. The main issue with the SPYs is their sell-off to the 61.8% Fibonacci level. It never ceases to amaze me how important those numbers are. The daily chart shows the SPYs are in a rally, but the bars are pretty weak. Ideally we would like long and strong candles -- that is, candles that are tall mostly filled. That would indicate prices opened low and closed high and probably maintained that momentum throughout the day. 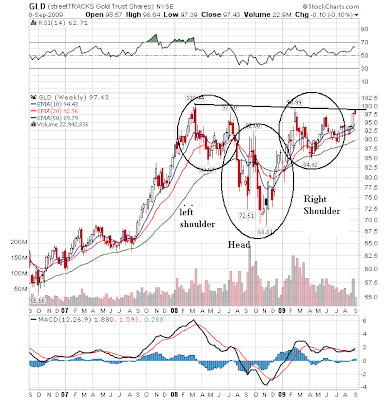 The bars on the chart are a lot weaker and just don't inspire a lot of confidence. Reports from the 12 Federal Reserve Districts indicate that economic activity continued to stabilize in July and August. Relative to the last report, Dallas indicated that economic activity had firmed, while Boston, Cleveland, Philadelphia, Richmond, and San Francisco mentioned signs of improvement. Atlanta, Chicago, Kansas City, Minneapolis, and New York generally described economic activity as stable or showing signs of stabilization; St. Louis remarked that the pace of decline appeared to be moderating. Most Districts noted that the outlook for economic activity among their business contacts remained cautiously positive. I'll have more on this tomorrow. The short version is this adds more evidence to the thesis that the recession is over. At the beginning of this decade, temporary hiring turned down in April of 2000, eleven months before the 2001 recession began. 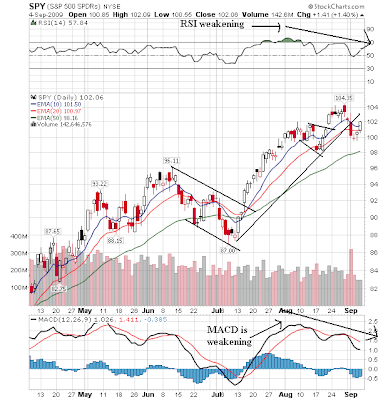 After the economy weakened, it would end up putting in a double bottom. The first time temporary hiring bottomed was in December 2001, just one month after that year's recession ended. It rose modestly, as the overall jobless recovery began. Interestingly, it turned down again and bottomed in April of 2003, a month after that year's bottom in the stock market. Following the most recent economic expansion, temporary employment peaked in December 2006, a year before the start of the current recession. It's fallen for 20 consecutive months through August, failing to reflect the recent strength in the stock market. Temporary hiring will almost surely bottom prior to overall employment in this cycle. There’s no very polite way to put this: he’s simply wrong. Temporary jobs data has only been collected since 1990 (that's exactly 2 recession bottoms). Did you notice Hester mention that bottom? No, he didn’t. That would be, because both temporary help and total nonfarm payrolls bottomed in the exact same month: May 1990! The only other post-recession bottom in temporary hiring, in April 2003, coincided with the second lowest total nonfarm payrolls number, a whopping 0.02% (that’s 2/10,000’s) higher than the absolute bottom 4 months later in August. Some “reliable leading indicator,” huh? Apparently, continuing to deteriorate at a worse rate includes a loss of only 1/15 of that earlier this year. So, the real takeaway from Hester’s analysis of temporary help is that we shouldn’t expect total employment to pick up – at least until next month. May I please have his job? It must be nice to get paid well for being wrong, as opposed to blogging for free. On the weekly chart, notice we're at the tail end of a head and shoulders pattern. Obviously $1000 is a big psychological number and most investors are concentrating on a breakout of that level as a sign the secular bull market is still intact. However $1000 isn't the important level. 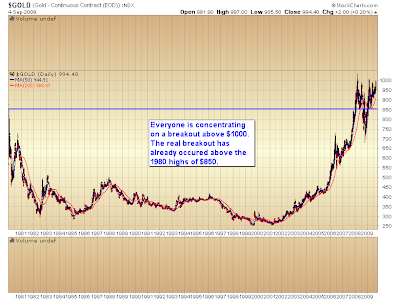 The important breakout has already occurred when gold took out the 1980 highs of $850. W.D. Gann noted that the size of the consolidation often signals how large the ensuing rally will be once an asset breaks out of that consolidation. The 28 year consolidation in gold is foretelling a bull market rally like no other that any of us have ever seen. Actually, I'm a day behind thanks to the long weekend. I'll post the commodities charts later today. There are two important points on the weekly chart. First, prices have broken an upward sloping trend line that started in mid-2007. This is actually a health development as it indicates money is moving from the safety of the Treasury market to more risk oriented assets. In other words, traders are now more comfortable taking risk which occurs in an economic expansion. Secondly, notice that prices are still above prices that occurred in 2008. This tells us prices ultimately have a ways to move lower. The daily chart shows that prices are in a consolidation pattern, fluctuating between 87.5 and 92. The MACD is about to give a sell signal -- which is in direct contrast to the MACD on the monthly chart which has given a buy signal. after opening higher, prices traded in a pretty narrow range of roughly 60 cents. Starting right after noon, prices used the SMAs for technical support. There was a big volume surge at the end, but it didn't move anywhere. nonrevolving credit decreased at an annual rate of 11-3/4 percent. Click for a larger image (obviously). For the second consecutive survey, domestic banks reported little change in their willingness to make consumer installment loans. The net fraction of domestic banks that reported tightening credit card lending standards fell significantly from nearly 60 percent to around 35 percent. Similarly, the net fraction of domestic banks that reported tighter standards on consumer loans other than credit cards declined to 35 percent, from 45 percent in April. For both credit card and other consumer loans, domestic banks continued to report tightening of loan terms and conditions, although the net fractions of banks that tightened were not as high as in April. The net fraction of domestic banks reporting weaker demand for all types of consumer loans rose a few percentage points, to about 20 percent. While banks are tightening standards, the percentage of banks who are tightening standards has been dropping since late 2008. In addition, notice that the rate of loan tightening is about the same level as 1996 when the economy was expanding. In other words, current levels of loan standards regarding consumer loans is not necessarily a drag on economic growth. Above are two charts. The first shows MZM and the second shows M2. Both use year over year measurement numbers. 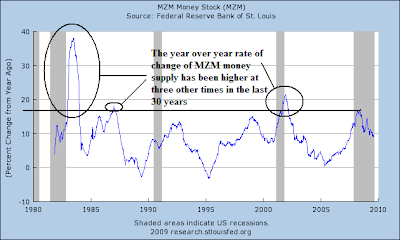 Both show that at several other times we have experienced higher year over year money supply growth. Yet, at no time in the last 30 years have we experienced hyper-inflation -- or even the threat of it. I've got a new post up at my other haunt, Blah3.com. Feel free to wander over and check it out. The weekly chart shows an index that is still rallying. The MACD and RSI are still increasing, the 10 and 20 week EMAs have moved through the 50 week EMA and prices are in an uptrend. However, also notice that the chart is printing some weak candlesticks that tell us prices aren't moving higher as strongly as we would like in a rally. The daily chart shows increasing weakness. 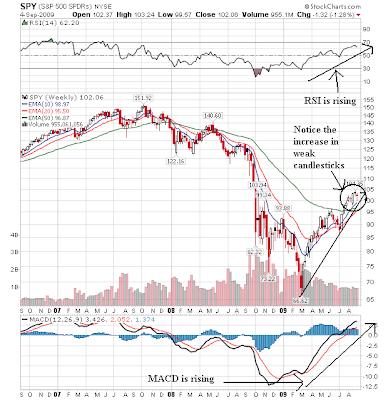 First, the MACD and RSI are decreasing. In addition, both indicators have printed a decrease while prices have increased. This is the type of divergence that traders look for in a reversal. Like a roller coaster at the bottom of that terrifying first drop, the leading part of the economy has turned up, but the lagging part continues to drop. That's the message from this past week's economic statistics, which focused heavily on manufacturing and jobs. Manufacturing has surged into growth. Jobs continue to decline and unemployment claims are stubbornly high. As to whether we will have a V-shaped jobs recovery, or a "jobless recovery" that requires strong GDP growth just to generate a single additional new job, the answer appears to be, "both." I'll explain why that is below the fold. This is likely to be an old-fashioned recovery, where manufacturing leads the way. This past week we got a slew of data about the strength of the manufacturing rebound. Most importantly, the Institute of Supply Management's manufacturing index recorded outright growth, it's reading of 52.9 (above 50 indicates growth) was not only significantly higher than estimates, but according to the ISM, "the highest since June 2007." The new orders index likewise surged, "up 9.6 points to 64.9 percent, the highest since December 2004." The deliveries index, a leading indicator, also improved to 57.1. Inventories shrank, meaning that replacing goods on shelves will require more manufacturing in the future. although new orders for consumer nondurable goods, the only poor item of data, declined 1.9%, remaining the only leading indicator not to have turned up in the last 6 months. Yesterday's report showed that manufacturing workweek and overtime were steady, neither improving nor declining from July. II. But employment and unemployment data remain weak. While manufacturing strengthened, this did not feed through into job growth. Yesterday the BLS reported that the US economy shed ( - 216,000) jobs in August, a modest improvement over July's negatively revised ( - 276,000). This was in line with private reports from earlier this week, and the Institute for Supply Management's manufacturing and non-manufacturing surveys, which showed similar improvement but still more businesses laying off than hiring. Meanwhile, new jobless claims remain stubbornly high at about 570,000 a week (seasonally adjusted). That means that there is a gradual increase in hiring taking place, but not enough to offset the continued firing of employees. Employers simply aren't ready to add new workers yet. Instead, they're handling increased orders by working existing employees harder. Notice that mean duration of unemployment has already peaked in 2009. Nevertheless, these employment and unemployment reports show continued pain, and especially given the huge number of people who have been unemployed for a very long period of time. Most significantly, there a more longer term unemployed now than during any post World War 2 recession. In Part I above I highlighted the ISM manufacturing index, which surged from contraction to expansion in August. How well does this index's reading of expansion correlate with job growth? As it turns out, manufacturing growth and increased employment correlate very well. This tells us a lot about what to expect in the next few months. Let me show you how well the two data series fit, below. Notice that the first month of growth shown by the ISM index nevertheless coincided with a negative jobs number. Keep that in mind later. Let's look at them in turn. The 1990 recession ended in March 1991, but employment declined until May. Unemployment didn't peak until June 1992. Although throughout that period, typicially the economy did add jobs, unemployment still rose. You need ~150,000 new jobs every month to keep up with population growth, and the recovery wasn't strong enough. Aside from that, a positive ISM reading correlated perfectly with positive jobs data. Next, let's look at the 2001 recession. Despite ending in November 2001, unemployment did not peak until June 1993, and employment continued to decline until August 1993. This time, the "recovery" was so weak, job growth was almost non-existent. Notice again how well the two series correlate with one another. In this, our first month after manufacturing returned to growth, the economy subtracted ( -216,000) jobs. The recent initial jobless claims, payroll, and unemployment data strongly indicates that those metrics remain true. Merely having manufacturing return to growth isn't enough to generate new jobs. The growth must be strong enough to overcome the drag of outsourcing and "productivity." So, will it be? Bottom line: it looks like August Leading Economic Indicators (and revisions to July) will net about +0.4, the fifth positive reading in a row. A weekly measure of future U.S. economic growth rose in the latest week, while its yearly growth rate surged to a 38-year high that suggests the recovery is on track. The Economic Cycle Research Institute, a New York-based independent forecasting group, said its Weekly Leading Index rose to 124.7 in the week to August 28 from a downwardly revised 124.3 in the previous week, originally reported as 124.4. The index's annualized growth rate rose to 20.8 percent from 19.6 percent a week earlier. The latest reading was the index's highest yearly growth rate since the week to May 21, 1971, when it stood at 21.3 percent. Conclusion: To the Question, "Will it be a V-shaped jobs recovery, or a 'jobless recovery'", the answer seems to be "Both." 1. Job loss in the recession -- about 8 million and wiping out an entire decade of growth -- has been terrible and remains persistent even as the leading parts of the economy -- housing and manufacturing -- have actually started to grow again. Unlike the earlier post-World War 2 recoveries, in the past decade it has taken strong economic growth of 2% or more just to generate a single new American job. The indications certainly are that the same headwind - aided and abetted by offshoring - persists and will remain a blight on the economy. 2. Meanwhile, manufacturing has undergone a breathtaking turnaround. The manufacturing index's average change of +3.3 in the last 5 months is a stronger move than in either of the two previous "jobless recoveries." In the 2002-3 recovery, manufacturing stalled out, never raising the index above 53.6. In contrast, in early 1983 the manufacturing index quickly rocketed to 56.1, adding a quarter million jobs in that month. That is the same type of growth that ECRI is predicting in the quote above. 3. We will probably continue to experience job losses if housing and manufacturing stall out here. 4. But the ISM deliveries subindex is part of the LEI, and that index continues to move in a positive direction. 5. So in conclusion, the odds favor the manufacturing index continuing to rise in the next several months, and if that happens, then despite the headwind of needing to have 2% GDP growth to generate jobs, we may nevertheless see job growth shortly. Post Script: Conclusively proving that I Have No Life, I have spent considerable time since I drafted the above looking for a better leading indicator for when job growth did ultimately occur after the 1991 and 2001 recessions. Part 3 above is a good first stab at it, I think, but I would like to be more confident in that part of the analysis. In other words, hopefully a more refined analysis with more confident conclusions, soon.